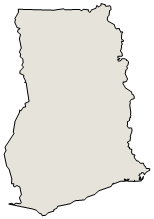 Formed from the merger of the British colony of the Gold Coast and the Togoland trust territory, Ghana in 1957 became the first sub-Saharan country in colonial Africa to gain its independence. Ghana endured a long series of coups before Lt. Jerry RAWLINGS took power in 1981 and banned political parties. After approving a new constitution and restoring multiparty politics in 1992, RAWLINGS won presidential elections in 1992 and 1996, but was constitutionally prevented from running for a third term in 2000. John KUFUOR succeeded him and was reelected in 2004. John Atta MILLS took over as head of state in early 2009.
name: "God Bless Our Homeland Ghana"
Ghana is well endowed with natural resources and agriculture accounts for roughly one-third of GDP and employs more than half of the workforce, mainly small landholders. The services sector accounts for 50% of GDP. Gold and cocoa production and individual remittances are major sources of foreign exchange. Oil production at Ghana's offshore Jubilee field began in mid-December and is expected to boost economic growth. Ghana signed a Millennium Challenge Corporation (MCC) Compact in 2006, which aims to assist in transforming Ghana's agricultural sector. Ghana opted for debt relief under the Heavily Indebted Poor Country (HIPC) program in 2002, and is also benefiting from the Multilateral Debt Relief Initiative that took effect in 2006. In 2009 Ghana signed a three-year Poverty Reduction and Growth Facility with the IMF to improve macroeconomic stability, private sector competitiveness, human resource development, and good governance and civic responsibility. Sound macro-economic management along with high prices for gold and cocoa helped sustain GDP growth in 2008-10. In early 2010 President John Atta MILLS targeted recovery from high inflation and current account and budget deficits as his priorities.